Your users want instant response and the ability to achieve their objectives quickly and effortlessly. They are looking for an experience so engaging, intuitive, and effective that the tool itself becomes invisible. Just a natural part of their day-to-day functions. For the business, there is lasting daily ROI found in optimizing this experience and, at Surround Technologies, we are driven to build the most efficient, mission-driven, and objective-focused software applications possible to produce truly superlative solutions. 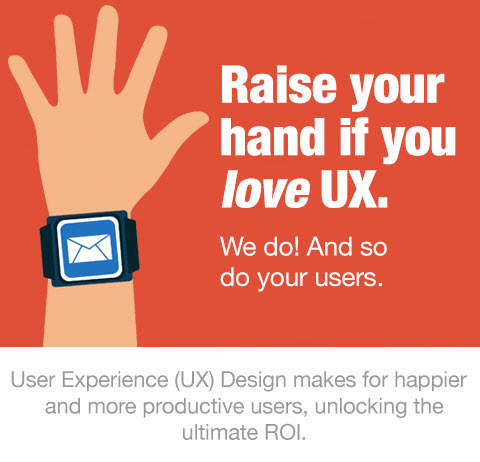 So, What is UX you ask? User Experience (UX) Design aims to enhance how a user feels when interacting with a system. A system can be anything from a website, web app, desktop software, or smart device app for emerging technologies such as smart watches. UX Design improves user satisfaction by improving the overall usability of a system, its ease of use, its efficiency in performing tasks, and the user's perception of the systems use or value. Put simply, you can have the most robust system ever developed, but without proper focus on its usability, the system will never meet its full potential as users will not interact with it efficiently or even willingly. By understanding human behavior and the needs of the users the system is intended for, we can pave safe ways to achieve the goals intended by developers and their organizations. Surround has identified 8 Top Keys to a productive User Experience. Utilize these keys while designing your software user interfaces and you will unlock superior productivity gains. The kind of productivity that transforms users into your competitive weapons. 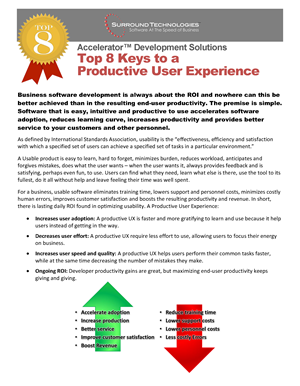 Business software development is always about the return on investment, or ROI, and nowhere can this be better achieved than in the resulting end-user productivity. The premise is simple. Software that is easy, intuitive, and productive to use accelerates software adoption, reduces learning curve, increases productivity, and provides better service to your customers. Get a road map and accelerate your application modernization. Schedule a consultation with our experts to get ideas for your modernization road map and learn how you can accelerate that modernization as well as all your software development. And we can use your data. If you want, we can skip the demoware and work with your data to show you the great potential your legacy software still has in it! How you get a Productive User Experience. Designing and creating Productive User Experiences is best achieved by dedicating User Experience (UX)/User Interface (UI) expert(s) within your development team. UX/UI experts understand how people use software and the many intricacies that go along with it. This is a relatively recent field and a specialized talent that comes with experience and requires continual research both in the industry as well as with your own users to stay up-to-date. Consistent across the different parts of the application. Will provide the necessary functionality and productivity to deliver an ROI that justifies the cost, time, and effort. Is well-articulated to and understood by the development team. Can be delivered by the development team within an effort and time frame that can be justified by the ROI. Is a measure of the software quality and is part of your quality assurance process. Superior user experiences on any device for any purpose. Surround has invested heavily over the last 15 years into defining, designing, testing and analyzing the interfaces that make up our current frameworks. These interfaces have changed and matured over the years as technologies and devices have changed. We are continually educating our User Experience experts as well as working with our customers so as to continually evaluate and advance our frameworks. 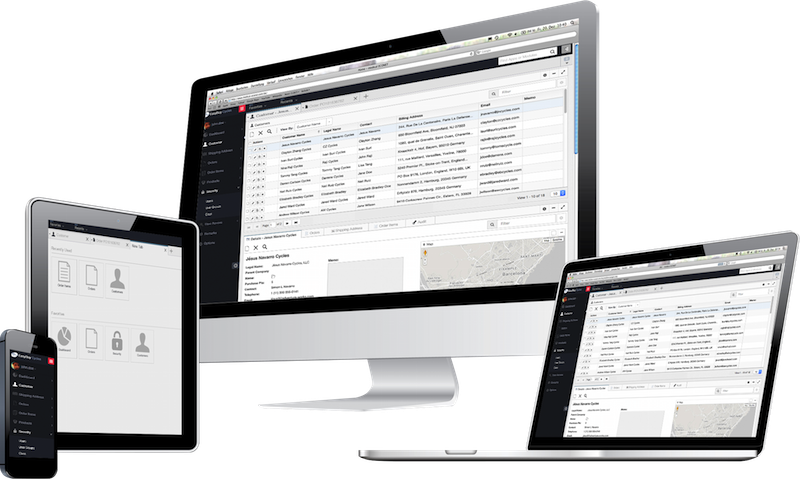 As a result of these efforts, Surround combines its core software and architecture with powerful software generation to produce superior applications that incorporate all Top 8 Keys to a Productive User Experience. You can deliver Web, Native Windows, and Native Mobile applications with user experiences that are interesting, productive, and satisfying. From the initial look-and-feel to the comprehensive functionality, along with customizable preferences for the basic novice to the most advanced users, there is something for every user to fall in love with. It is so good that the base generated system is often confused by many users to be the completed software as it is. There are many different presentation frameworks that can be used such as Line of Business, Product Catalog, Wizard, Dashboard, Task Pane, Touch Screen, and Advanced Information Visualizations. There is also complete skin and theme support built into the interfaces with several pre-built skins available. Surround has had a lot of experience working with and developing solutions with our customers. We continually take these experiences and create best practices, helper classes, frameworks, and pre-build add-ins that can be easily configured, integrated, and customized into your applications. Surround has dedicated User Experience experts that tirelessly work with our developers and our customers designing and enhancing our solutions to optimize user, productivity. It is not enough for user to just like the software, they have to love it. There are no limits to how you can use your application interfaces. Most customers use the Accelerator’s well thought out superior user experience, but sometimes there are business needs to go beyond that. With Accelerator you can create in part or in its entirety your own user experience with full integration to the user management, security, and other Accelerator services. You can even enable other 3rd party applications to access the services for seamless integration with them. All of which can be monitored, managed, and controlled through the Accelerator Maintenance and Interface consoles. This gives you control over your systems and data while providing the necessary access for whatever business needs may arise. Surround also has several professional service options to help you with your particular software UX needs. Our customers often have very talented developers, but still need a little extra help in how particular functionality should look and feel within their application. We can help evaluate current applications as well as evaluate how to get more productivity with current business processes. Take a look at the list of Accelerator Features to see what items are important to your users. You get a proven, robust, and very productive user experience at a fraction of the cost to research and define yourself. Plus, you get pre-built core architecture software combined with software generation so that your developers can easily deliver the solutions you are expecting. Most importantly, you get it right now. Not weeks, months, or perhaps years from now. Check that off the list and now focus on the business aspects of the software. You users will love you for it, your boss will praise you for it, and the developers will thank you for it. It’ll make software superheroes of the entire team!